The last of the weekend, Race Five of the Tasmania Microsoft Office 365 follows on from plenty of action. After an amazing effort from the Bottle-O Racing team, David Reynolds' Falcon is back out on the grid and with today's qualifying format, he starts from p10. Anthem playing, cars on the grid - nearly ready to go! Cars on the warm up lap. L1 Winterbottom first into T1. Coulthard looking quick behind Frosty. L3 McLaughlin, Lowndes, Van Gisbergen all close down in 8, 9, 10. McLaughlin had a poor start, which dropped him back. L4 top five; Winterbottom, Coulthard, Courtney, Whincup, Will Davison. L5 Safety Car. Debris on the racetrack to be retrieved. Winterbottom holds the fastest lap, 52.4238 (L3). L6 Piece of body work hanging off Reynolds' car. L8 restart. 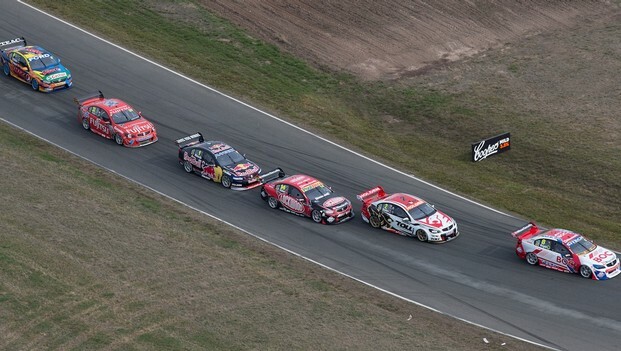 Close racing with Lowndes and Van Gisbergen, fighting over ninth. L15 Coulthard fastest lap of the race 52.1684 (L8). L16 Winterbottom goes quicker, setting the pace with 52.1341 (L15). L18 Top five is Winterbottom, Coulthard, Courtney, Whincup, Bright. L19 Tander trying to sneak down the inside of Lowndes for tenth. L23 Coulthard recorded fastest lap 52.0741 (L17). L25 Just over halfway and the top hasn't changed - Winterbottom, Coulthard, Courtney, Whincup, Bright. L26 Blanchard going for tyre change, looks like there may be an issue. L31 Seems fairly processional, though Bright is getting close to Whincup. L33 Holdsworth in p15 - if he can hold it, will be his best result of the year. L33 Massive crash for Scott Pye straight ahead at T2. Some sort of brake issue it sounds like. He's ok. Heavy impact as the car lifts high above the ground. Safety car. The race may be called to time. Now on L37. Nope - restarting on L38 for a sprint to the end. L38 Tander through on Lowndes, Lowndes with a gearbox issue? Tander to p10. L39 Coulthard through for the lead at the hairpin. L40 Top five: Coulthard, Winterbottom, Courtney, Whincup, Bright. Bright looking strong on the back of Whincup. L41 Pye cleared by medical, with a sore wrist and jaw. Bright around the outside at T4, into fourth. Final result: Coulthard, Winterbottom, Courtney, Bright, Whincup, Will Davison, Webb, McLaughlin, Van Gisbergen, Tander. Coulthard - Have to capitalise when car is good and it was very, very good. Winterbottom - Car was good... we'll give it back to him at another round... Contact smashed front tyre. Courtney - Crazy old weekend, good pace at all different times... Good qualifying second one this morning... Consistent car looked after it's tyres but at the end there a little bit hairy. Whincup - Think we're improving to be honest... This weekend pole position but nowhere near where we'd like to be... Could be a lot worse... taking the points. We're not really in the battle, just trying to hang on with the lead guys... We were down in the dumps last year with FPR and turned it all around. Courtney up into third in the championship.